Akiko "Akko" Wada, born Kim Bok-Ja (Korean: 김복자; Hanja: 金福子; April 10, 1950), is a female Japanese singer and television performer of Korean ancestry, originally hailing from Higashinari-ku, Osaka. Like many Zainichi Koreans, she had a legal Korean name and a name for everyday use, which was Japanicized Fukuko Kaneumi (金海 福子). Due to her above-average height (174 cm or 5' 8.5"), she is nicknamed "jotei", meaning "empress". She is signed to the HoriPro entertainment agency. She voice acted as Koopa in Super Mario Bros.: Peach-Hime Kyushutsu Dai Sakusen!, the first time he had been voiced. She also performed with the music group m-flo on the song "HEY!" on their Beat Space Nine album which was released in 2005. 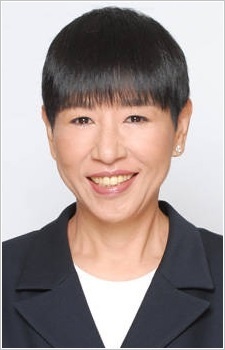 Along with fellow Japanese entertainers Takeshi Kitano, Ken Shimura, and Nobuyoshi Kuwano, she severely criticized TV star Masashi Tashiro after his arrest for voyeurism. Worst Bowser voice to date. Biggest miscast of last century. Glad she's not ruining any more characters. Always wanted to know more Japanese-related jokes about her. (Especially since the first OVA episode of yondemasu azazel san).